Gharol is an Orc blacksmith living in Dushnikh Yal, the Orc stronghold southeast of Markarth. She is the forge-wife of Chief Burguk and mother of Umurn and Lash. When Lash decided to leave the stronghold for mining duties in Karthwasten, the grief-stricken mother forged a special sword, which she will ask you to deliver as a message to her daughter. She will also pay you for any orichalcum ore you bring her. As a smith, she also sells a variety of weapons and armor (after you accept her quest). If you are Blood-Kin to the Orcs, she will train you in Heavy Armor. As Burguk's second wife, Gharol rarely gets to spend time with her husband, who prefers the company of Shel. Instead, she works the forge every day between 8am and 8pm, offering her various services. When the sun sets, she enters Burguk's Longhouse for a four-hour dinner until her bedtime at midnight. 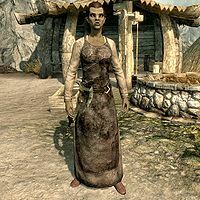 She wears typical blacksmith attire, a blacksmith's apron with matching shoes. In combat, Gharol wields two leveled weapons; at level 1 she uses a steel war axe and a hunting bow; at level 6 she uses an Orcish war axe and an Orcish bow. She carries leveled arrows for the bow and a selection of middle-class items and gold. When you approach her she will quickly try to cut you a deal: "You wish to trade in Orc steel? ", "Strong gauntlets for strong hands." and "Blades to kill your prey and your rivals." She will also tell you about her role in the stronghold: "I'm Burguk's forge-wife. I shape all the steel for the stronghold." and will add, "As forge-wife, I'm also in charge of our mine." When asked about her business and whether or not she trades with other cities, she will tell you a story: "Occasionally. But an Orc blade is a very personal thing. Anger, regret, pride. All these things are put into our steel. When my daughter Lash chose to leave the stronghold, I forged a sword to channel all my shame and grief. Honor me with a task, outlander. Bring the sword to my daughter, if you see her. It'll be all she needs to know." When you bring the sword to Karthwasten, Lash will get the message right away, saying, "So that's it, then. "Don't come back." Thank you. Here. You honored my mother's task and should be rewarded. Now, I need to be alone." Gharol: "Imagine the heads of your enemies as you forge. Let your hatred work the steel." Umurn: "The metal has been stubborn today. It refuses to bend." Gharol: "Save your anger for the forge. The steel cannot hear your whining." Umurn: "Sorry, mother. I'll focus on my work." Gharol: "Ah, is there any weapon finer than an Orc blade?" Umurn: "No, mother. It's no wonder our enemies fear the sight of an Orc warrior." This is the merchandise found in Gharol's merchant chest. These items are only available if purchased from the merchant; they cannot be pickpocketed or stolen. They are restocked every two days. While Gharol offers expert training in Heavy Armor, the dialogue to do so becomes unavailable once the player's Heavy Armor skill reaches 50 or above.